Arunachal Pradesh chief minister Pema Khandu on Thursday said that a walk through market is being developed in Tawang, which will be more attractive than the popular Mahatma Gandhi Marg of Gangtok in Sikkim. 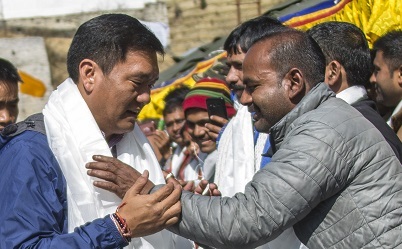 “Tawang being a tourism hot spot, the State Government has taken several development initiatives to develop it and for the construction of the proposed road, a sum of Rs 25 crore has been sanctioned by the government,” Khandu who was in Tawang on Thursday to attend the Losar celebrations said. Popularly known as MG Marg, the walk through market in Gangtok is lined up with glittering shops, restaurants, cafes and bars on both sides. The entire area is free of litter, smoke and vehicle. It’s a pedestrian only zone and vehicles are not allowed on this approximately one km stretch of the road. The chief minister on the day also announced that a new airport for Tawang is also on the cards as the airport authority has identified a land for the airstrip. He further assured to push for immediate construction of the airport, which can be jointly used for civilian and defence purposes. Earlier, the chief minister extended his Losar greetings to people. Also present on the occasion were MLAs Tsering Tashi, Jambey Tashi and Phurpa Tsering.